Hello everyone! 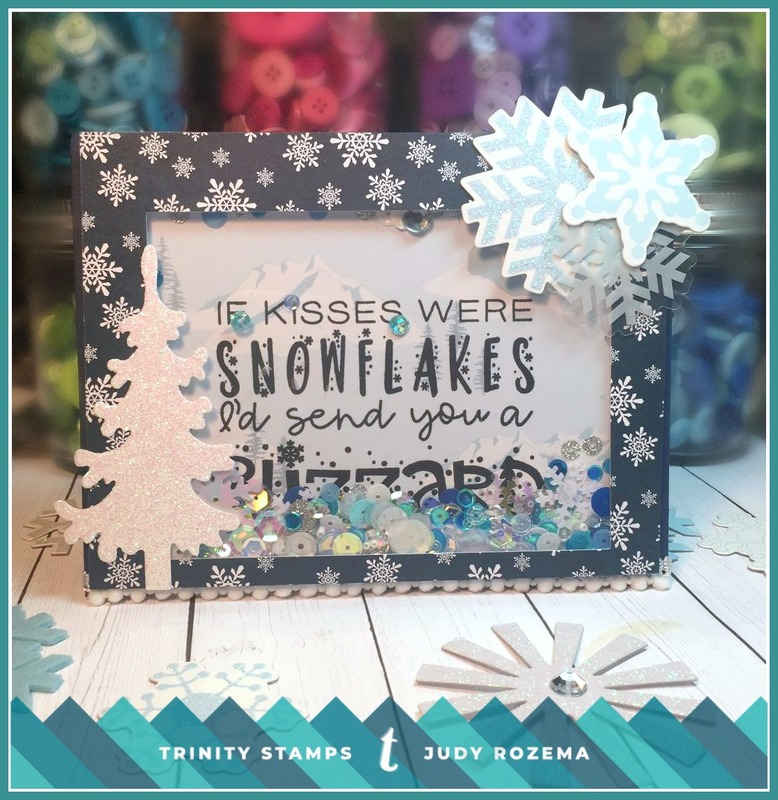 Judy here with a fun shaker card today! I hope you have been seeing this stamp on our Instagram, Facebook page, and YouTube channel, as well as my teamies’ blogs and social media, because it’s a fun one — and it’s FREE!! 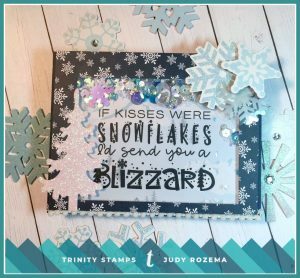 That’s right — during Trinity Stamps’ Black Friday Sale you can get this 3×4 “Snowflake Kisses” stamp for free with a $60 purchase. 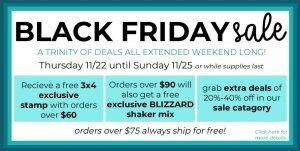 AND even better — spend $90 and get the AWESOME Blizzard Shaker Embellishment Mix FREE! 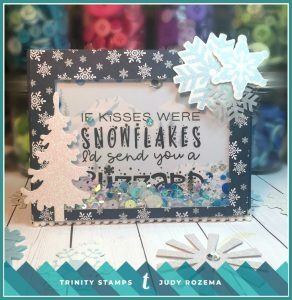 I started by choosing some fun background paper with snow-capped mountains and evergreens and then stamped “Snowflake Kisses” with VersaFine Clair Nocturne ink. I cut my frame and adhered my acetate (I am a former teacher and use clear transparency sheets that we used to use for overhead projectors! ), and then sprinkled a generous amount of the shaker mix onto the sentiment. Sometimes I make my shakers one way (mix on the bottom) and sometimes I make them the other (mix on the acetate) – it just depends on the design, and each works fine for me! You can see the variety of translucent, metallic, iridescent, glitter, and satin sequins and confetti below. It’s beautiful! 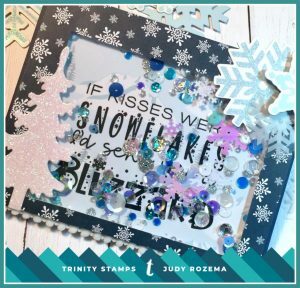 I added a die cut tree out of diamond glitter cardstock, and a few die cut snowflakes I have had in my stash forever. I use a few each year, and save them! Don’t miss getting this fun stamp! It is only available this weekend while supplies last! Have a wonderful Thanksgiving! You can find more of my projects at Joy in a JAR. Such a FUN shaker card! !